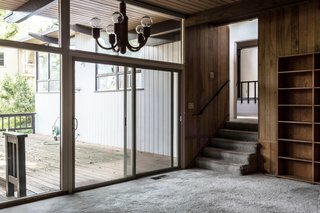 Recognizing the potential in a Wayne Littlejohn midcentury home, NMT financial collaborated with See Arch to restore the building while injecting contemporary character. 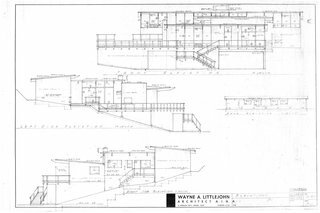 As a California native practicing in the Bay Area during the heyday of Eichler developments and Case Study Houses, modernist architect Wayne Littlejohn developed a style strongly influenced by the midcentury modern movement. 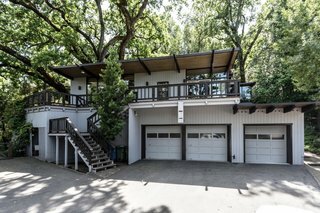 This hillside-embedded house completed in 1963 in Danville, California, bears the hallmarks of an Eichler—sweeping expanses of glass, deep cantilevered overhangs, and an embrace of indoor/outdoor living—yet it had fallen into disrepair by the time NMT financial discovered it last year. The home is split into four terraced levels that echo the surrounding topography. See Arch replaced many of the original single-pane wood windows with new thermally broken aluminum windows. NMT Financial directed exterior paint selections and deck restoration. 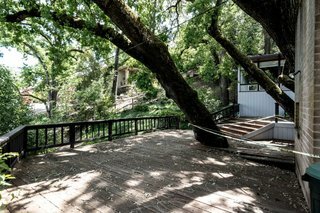 Fortunately, the damaged exterior and dismally dark 1970s interior didn’t scare away NMT Financial, who were captivated by the home wrapped around a massive oak tree embedded into the inner courtyard. 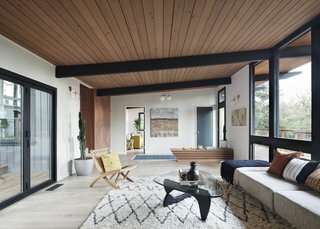 Oakland-based See Arch was hired to restore the home’s modernist character while updating the dwelling to contemporary standards. 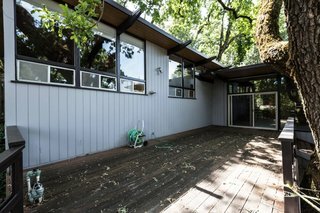 The outdoor deck showed signs of damage from natural weathering over time and lack of maintenance. NMT Financial repaired and refinished the deck. "This home is an exception to the modernist mantra of form follows function and we wanted to celebrate the playfulness and dynamic quality of the layout by emphasizing its interconnectivity and indoor relationship to the outdoors," the architects explain. 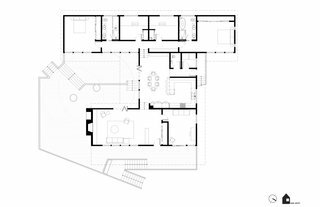 "The public and private spaces, as well as the terraced separation of program, allude to a family-focused, treehouse way of life and references many concepts inherent to Loos’ Raumplan." 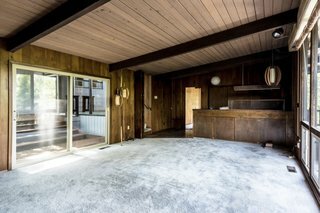 Wrapped in wood paneling and lined with old carpet, the dining area felt dark and stuffy before the renovation. 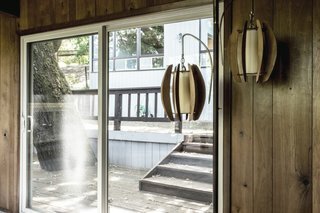 Folding glass doors creates a more seamless connection between the dining room and the outdoor deck. 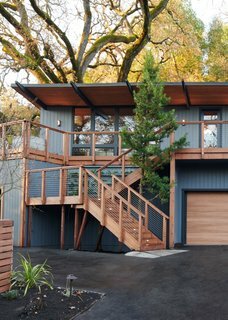 Littlejohn planned the 3,768-square-foot house as four terraced levels that climb up the hillside and embrace the landscape through large windows. 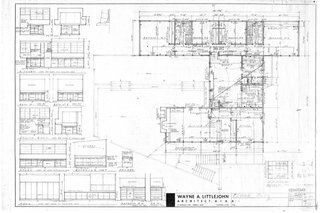 Emphasizing the original architect’s approach to indoor/outdoor living was an important part of the renovation; the interior layout and elevations were preserved, as were other key modernist details, such as the central living room hearth. The old living room was dominated by a muddle of brown colors. NMT Financial managed repainting of the architectural block fireplace. 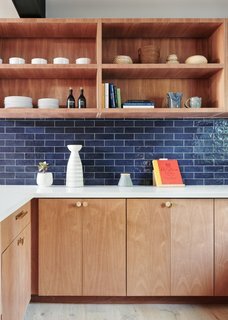 The existing stone-inlay ledge was reclad into a built-in wood and tile bench. Many of the dated and damaged surfaces were replaced. 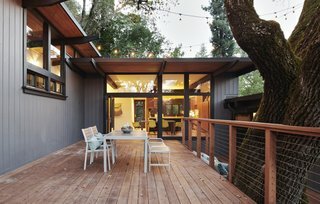 Thermally broken folding walls of glass replaced many single-pane sliding doors to strengthen the indoor relationship to the landscape. The interiors instantly brightened once the design team swapped the distracting wood paneling for new sheetrock and wood trim. 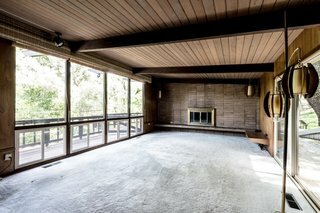 The dated living room was constricted with timber on all sides. The updated living room features new wide-plank white oak hardwood floors, a refinished wood ceiling and structural beams, and new sheetrock finished walls to replace original wood paneling for a brighter look. 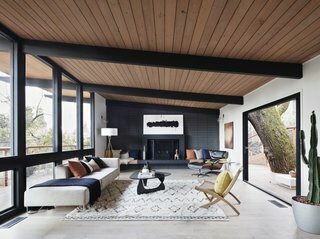 In another nod to the midcentury roots of the property, the renovated 3,768-square-foot home was fitted with a mix of iconic midcentury furnishings from Herman Miller and the Eames design collection, and more contemporary offerings from the likes of CB2, West Elm, and All Modern. See Arch replaced many of the original single-pane wood windows with more efficient, thermally broken windows. 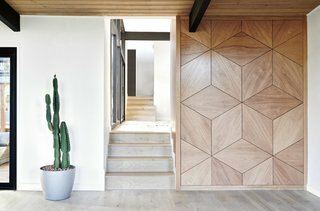 A geometric wood accent wall built by Greenport Designs lies across from the main entry wall and runs alongside the stairs. "The blend of contemporary and modernist features and use of wood built-in components are our favorite features of the project," the architects said of the new mahogany wood millwork and custom wall paneling. 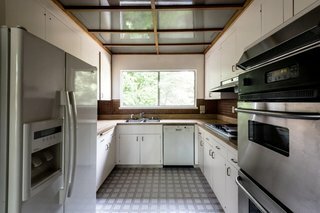 Despite the large window framing the outdoors, the existing U-shaped kitchen felt cramped compared to modern kitchens. An existing wall between dining, laundry and kitchen was removed to create a more spacious kitchen with a stronger visual connection to the dining area. The updated kitchen is outfitted with quartz countertops and Viking, Fisher Paykel, and Asko appliances. "We designed many custom millwork moments into the home to weave styles, levels, and spaces together. The kitchen is at the center of the home and it's the focus of the home’s new millwork. 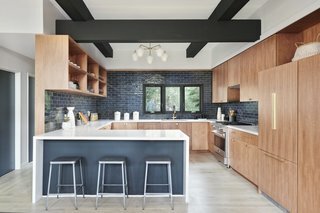 Accent wood walls become an extension of the kitchen cabinets and extend radially to both the front and back of the home, connecting the entry to the dining, kitchen, and utility areas." 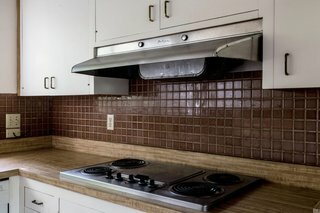 A look at the dated kitchen. All the pictured elements were swapped out for new materials and appliances. The updated kitchen features an Elite Tile backsplash selected by NMT Financial along with white quartz countertops, and new plumbing and lighting fixtures also selected by NMT Financial . These features were coordinated into the custom-millwork designed by See Arch and built by Greenport Designs. 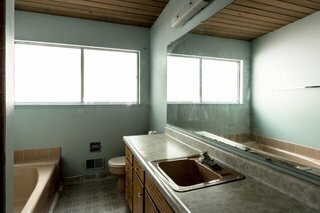 While the existing bathroom layout was perfectly usable, dated surface materials were swapped for a more contemporary look. 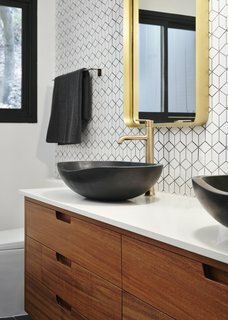 The renovation introduced new plumbing and lighting fixtures selected by NMT Financial, custom wood vanities designed by See Arch, and new tiled walls installed in all bathrooms. 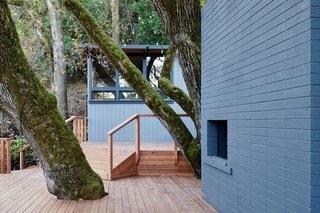 The home is built around an existing oak tree. The soffit cladding and deck were refinished along with necessary repairs. 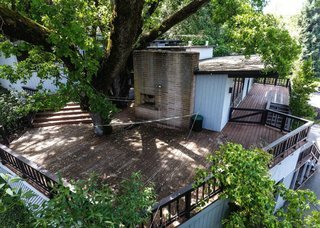 The exterior fireplace wall showed signs of water damage and aging, as did the weathered deck with overgrown vegetation. 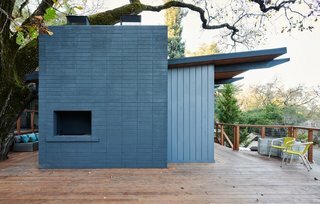 The exterior fireplace wall was restored. NMT Financial selected a deep blue hue to match the repainted blue timber cladding. Design Collaboration: NMT Financial, See Arch.